For the ship, see Sverdlov class cruiser. Dmitry Pozharsky (left) and Kuzma Minin (right) depicted in Mikhail Scotti's Kuzma Minin and Dmitriy Pozharskiy (1850). Dmitry Mikhaylovich Pozharsky (Russian: Дми́трий Миха́йлович Пожа́рский, IPA: [ˈdmʲitrʲɪj mʲɪˈxajləvʲɪtɕ pɐˈʐarskʲɪj]; 17 October 1577 - 30 April 1642) was a Russian prince known for his military leadership during the Polish–Muscovite War from 1611 to 1612. Pozharsky formed the Second Volunteer Army with Kuzma Minin in Nizhny Novgorod against the Polish–Lithuanian Commonwealth's occupation of Russia during the Time of Troubles, resulting in Polish withdrawal after Russian victory at the Battle of Moscow in 1612. Pozharsky received the unprecedented title of Saviour of the Motherland from Mikhail I of Russia, becoming a folk hero in Russian culture and honored in the Monument to Minin and Pozharsky in Moscow's Red Square. Dmitry Mikhaylovich Pozharsky is considered to have been born on 1 November 1578 in Klin County, in the north of Moscow Governorate of the Tsardom of Russia. Pozharsky was descended from a dynasty of minor sovereign princes which ruled the town of Starodub-on-the-Klyazma, near Suzdal 190 kilometers (120 mi) northeast of Moscow. At one point in the 15th century the family estate burned to the ground, and in consequence assumed the name of Pozharsky, derived from the Russian word pozhar meaning conflagration. Pozharsky's mother, Maria Feodorovna Pozharskaya, came from the Beklemishev family of Turkic origin, just like the mother of Mikhail Kutuzov, who was credited with saving Russia precisely two centuries after him. Pozharsky's early career was not documented until the beginning of the Time of Troubles following the death of Tsar Feodor I in 1598, when he took part in the Zemsky Sobor which elected Boris Godunov as the Tsar of Russia. Pozharsky's closeness to the throne during Godunov's rule made him an influential figure among Russia's nobility. Pozharsky was attested as a stolnik four years later and supported the Tsardom in the Polish-Muscovite War following its outbreak in 1605. Pozharsky was present at the defense of Kolomna in 1608 and helped Vasily IV during the siege of Moscow in 1609. Later that year, Pozharsky routed the rebellious Cossacks of Ivan Bolotnikov at the Pekhorka River. In 1610, Pozharsky was in command at the defense of Zaraysk against the forces of False Dmitry II. Pozharsky and the delegation from Moscow. Painting by Wilhelm Kotarbiński (1882). By this time, Russian popular indignation against the Polish-Lithuanian Commonwealth's occupation had gained momentum due to perceived abuses and criminal behavior of the Polish army, and the loss of support among the pro-Polish faction of Russia's boyar class due to the actions of King Sigismund III. After Prokopy Lyapunov rallied the First Volunteer Army in Ryazan, Pozharsky promptly joined the cause and took a prominent part in the uprising in Moscow. Pozharsky was wounded on 19 March 1611 while defending his house at Lubyanka Square and was transported by his adherents to the Trinity Lavra of St. Sergius for convalescence. In autumn 1611, when Pozharsky was recuperating at his Puretsky patrimony near Suzdal, he was approached by a delegation who offered him command of the Second Volunteer Army then gathered in Nizhny Novgorod to oust the Polish occupiers. Pozharsky agreed on condition that he would be assisted by Kuzma Minin, a representative of the merchants of Nizhny Novgorod that was instrumental in the army's founding. 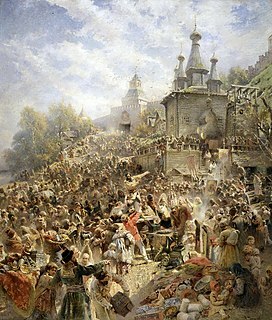 Although the volunteer corps aimed at clearing the Polish invaders out of Moscow, Pozharsky and his contingent marched towards Yaroslavl first. There they resided for half a year, vacillating until the opportunity for rapid action was gone. A man of devout disposition, Pozharsky fervently prayed before Our Lady of Kazan, one of the holiest Russian icons, prior to advancing towards Moscow. Yet even then he proceeded so slowly and timorously, performing religious ceremonies in Rostov and paying homage to ancestral graves in Suzdal, that it took him several months to reach the Trinity, whose authorities ineffectually sought to accelerate the progress of his forces. Finally, on 18 August 1612, the Volunteer Army encamped within five versts from Moscow, just in time when Hetman Chodkiewicz arrived with provisions to the relief of the Polish garrison barricaded within the Moscow Kremlin. The very next day, Pozharsky advanced to the Arbat Gate of the city and two days later he engaged with Chodkiewicz's contingent in a four-day battle. The outcome was in no small part due to decisive actions of Pozharsky's assistant, Prince Dmitry Trubetskoy, who captured the provisions intended for the Poles quartered in the Kremlin. As a result, a famine broke out among the Poles and they had to surrender to Pozharsky and Trubetskoy in October, after being guaranteed safe passage and humane treatment. Nonetheless, most of the Poles were slaughtered upon exiting the Kremlin and few survived captivity. Pozharsky and Trubetskoy presided over the Muscovite government for half a year, until a new tsar was elected by the Zemsky Sobor, whereupon Pozharsky was made a boyar and Trubetskoy was honoured even more highly. The Time of Troubles was now over, but minor risings couldn't be subdued for an extended period of time. In 1615, Pozharsky operated against the Lisowczycy and three years later he fell upon the forces of Vladislaus IV, yet the conservative system of mestnichestvo precluded him from taking supreme command in any of these engagements. He governed Novgorod in 1628-30 and fortified Moscow against an expected attack of the Crimean Tatars in 1637. Pozharsky's last taste of battle came during the ill-fated Smolensk campaign, when he was relegated to secondary roles. As soon as peace had been restored, Pozharsky was given some enviable posts in the Muscovite administration. Among other positions, he managed the Prikaz (Order) of Transport in 1619, the Prikaz (Order) of Police in 1621–28 and the Prikaz (Order) of Moscow Judges in 1637–37 and 1640–42. He was summoned by the tsar to confer with the English ambassadors in 1617 and with the Polish ones in 1635. In recognition of his services, he was granted extensive estates around Moscow, where he commissioned several churches, interpreted in retrospect as monuments to his own victory against the Lithuanians and Poles during a dire crisis in the history of Russian statehood. One such tent-like church survives in his suburban estate of Medvedkovo. Another was the Kazan Cathedral in Moscow, adjoining Red Square from north-east, a direction whence Pozharsky's army arrived to salvage the Muscovites in 1612. Pozharsky's family became extinct in 1672, upon the death of his granddaughter, who was married to Prince Yury Dolgorukiy, the most famous Russian commander of the time. Yet his memory would be cherished by the Romanov dynasty which to a great extent owned the crown due to his prowess and skill. When patriotic feelings were on the rise during the Napoleonic wars, a bronze Monument to Minin and Pozharsky was erected on Red Square. The day when Pozharsky and Minin entered the Moscow Kremlin as liberators was reestablished as a national holiday in 2005. During Euro 2012 group game between Russia and Poland, Russian fans unfurled a huge banner that read 'This is Russia' with Pozharsky's image. Wikimedia Commons has media related to Dmitry Pozharsky and Kuzma Minin. ^ "Moscow of the future from dreamers a century ago". rbth.com. Ksenia Isaeva. ^ "Kuzma Minin and Prince Dmitry Pozharsky". statues.vanderkrogt.net. ^ a b "Prominent Russians". russiapedia.rt.com. ^ "Russia Reported To UEFA Over Colossal 'This Is Russia' Banner Unfurled Against Poland In Warsaw » Who Ate all the Pies". Whoateallthepies.tv. Retrieved 2012-08-13. (in Russian) Koz'ma Zakharych Minin-the-withered-arm and Prince Dmitry Mikhaylovich Pozharsky, Nikolay Kostomarov, "Russian History in Biographies of its main figures". (in Russian) The antique heroes of the Russian people's militia "Kommersant-Den'gi", November 5, 2002. Red Square is a city square in Moscow, Russia. It separates the Kremlin, the former royal citadel and now the official residence of the President of Russia, from a historic merchant quarter known as Kitai-gorod. Red Square is often considered to be the central square of Moscow since the city's major streets, which connect to Russia's major highways, originate in the square. The Time of Troubles was a period of Russian history during the interregnum in the Tsardom of Russia between the death of Feodor I and the accession of Michael I from 1598 to 1613. Aleksander Korwin Gosiewski de armis Ślepowron, was a Polish nobleman, military commander and diplomat, Lithuanian Field-Quartermaster since 1630, Palatine-Governor of Smolensk from 1625, Lithuanian Great-Quartermaster since 1615, Speaker of the Parliament in 1613, Great-Secretary of the Grand Duchy of Lithuania from 1610 and District-Governor of Wieliż, Puńsk, Kupise, Biel, and Markowa. The Polish–Muscovite War, also known as the Polish–Russian War of 1605–1618 or the Dimitriads, was a conflict fought between the Tsardom of Russia and the Polish-Lithuanian Commonwealth from 1605 to 1618. The Trubetskoy family (English), Трубецкой (Russian), Трубяцкі (Belarusian), Trubecki (Polish), Trubetsky (Ruthenian), Трубецький (Ukrainian), Troubetzkoy (French), Trubezkoi or Trubetzkoy (German), is a Ruthenian Gediminid gentry family of Black Ruthenian stock, like many other princely houses of Grand Duchy of Lithuania, later prominent in Russian history, science, and arts. They are descended from Algirdas's son Demetrius I Starshy. 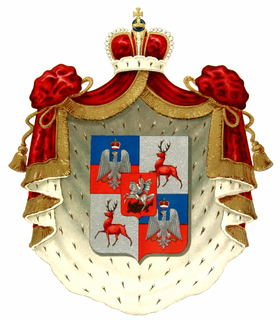 They used the Pogoń Litewska coat of arms and the Trubetsky coat of arms. Kuzma (Kozma) Minin was a Russian merchant from Nizhny Novgorod, Russia, who, together with Prince Dmitry Pozharsky, became a national hero for his role in defending the country against the Polish invasion in the early 17th century. Dmitri Konstantinovich of Suzdal was a powerful Prince of Suzdal and Nizhny Novgorod who dominated Russian politics during the minority of his son-in-law, Dmitri Donskoi. The famous Shuisky family descends from his eldest son, Vasily Kirdyapa. Hermogenes, or Germogen was the Patriarch of Moscow and all Russia from 1606. It was he who inspired the popular uprising that put an end to the Time of Troubles. Hermogenes was glorified by the Russian Orthodox Church in 1913. The Monument to Minin and Pozharsky is a bronze statue on Red Square in Moscow, Russia, in front of Saint Basil's Cathedral. The statue commemorates Prince Dmitry Pozharsky and Kuzma Minin, who gathered an all-Russian volunteer army and expelled the forces of the Polish-Lithuanian Commonwealth under the command of King Sigismund III of Poland from Moscow, thus putting an end to the Time of Troubles in 1612. Unity Day is a national holiday in Russia held on November 4. It commemorates the popular uprising which expelled Polish occupation forces from Moscow in November 1612, and more generally the end of the Time of Troubles and turning point of the Polish-Muscovite War (1605–1618). 1612 is a 2007 Russian epic historical period drama film about the 17th century Time of Troubles and the Polish–Muscovite War with the Polish-Lithuanian Commonwealth. It was directed by Vladimir Khotinenko and produced by Nikita Mikhalkov. The film was released on 1 November 2007, to coincide with the celebrations of National Unity Day on November 4 that marks the expulsion of Polish troops from Moscow. Stepan Anikiyevich Degtyarev, was a renowned Russian composer of Ukrainian origin of the late 18th century. He was most famous for his nationalistic Russian Choral Music. The Nizhny Novgorod Kremlin is a fortress in Nizhny Novgorod, the historic city center. The Battle of Moscow was a series of two battles, which took place in Moscow, on September 1 and 3, 1612, during the Polish–Muscovite War (1605–18). Forces of the Polish–Lithuanian Commonwealth were commanded by Field Hetman of Lithuania, Jan Karol Chodkiewicz, while Russians were led by Dmitry Pozharsky. The battles ended in tactical Russian victory. The Minin and Pozharsky Square is the main square of Nizhny Novgorod. It is a social and cultural center of the city, the venue of the most important celebrations. It is located in the historical centre of the old town from the southeast side of the Kremlin. The Dmitrievskaya Tower is the main tower on the southern wall of the Nizhny Novgorod Kremlin which overlooks the Minin and Pozharsky Square. The tower named after a powerful Prince of Suzdal and Nizhny Novgorod Dmitry of Suzdal. Another version claims that the name gave a church which was sanctified of the name of Saint Demetrius of Thessaloniki. This church was located opposite the tower.